Wearing our Rainbow Silicone Bracelet is a great way to show your support for Autism & Asperger’s Awareness. 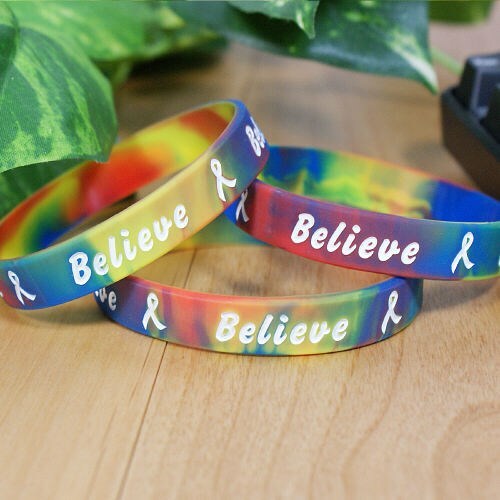 Each rainbow Autism Awareness Bracelet Bracelet arrives with the word Believe and is accented with awareness ribbons to make the perfect addition to any team supporting the cause. Measuring 2.5” in diameter and fits most wrists. Nice awareness bracelets to give out. Today’s Price: $2.30 In Stock! Me and my partner have worn our "Believe" bracelets since 2012 and they're still as good as they were when we got them. I cannot recommend them enough. They're durable and colourful. I wish they had an option to get one that said "Asperger's" or "Autism" as well as "Believe", but I do love this one as is. Additional Info We offer many Autism & Asperger's Awareness Apparel and Gifts so that you may show your support each day. Our Awareness Keepsakes & Apparel are perfect for any Special Charity Events or Awareness Walks.